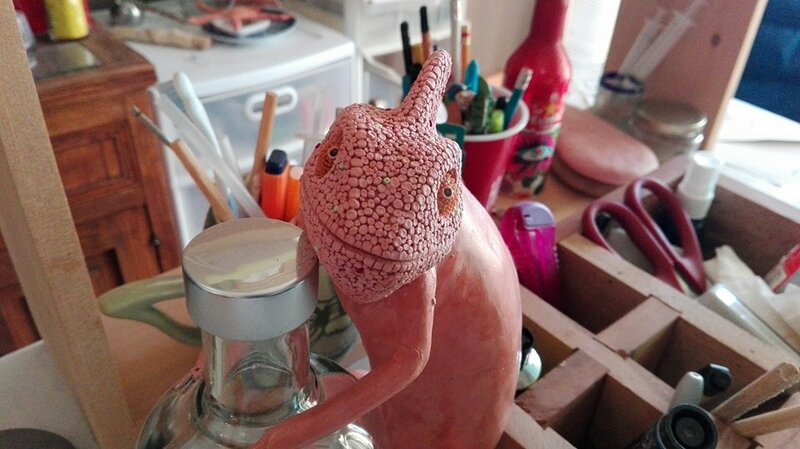 The Jackson chameleon in process. Sustainability matters more than ever. It is crucial and I believe that our future depends on it. I also believe we should aim towards shaping our lifestyles so that it will have the minimum impact on the environment – or none whatsoever – in order for us to enjoy a healthy life on a healthy planet. Sustainability is therefore a crucial factor in my artwork. For that reason, I believe we should use Art’s huge potential of grabbing people’s attention on topics, to embrace, henceforth, sustainability in their lives. Economy: Waste as raw material keeps material costs low, reduces the impact on the environment and allows more time for the creative process. Society: Sustainable art connects people with nature and draws attention to environmental issues. It can be a catalyst towards change. 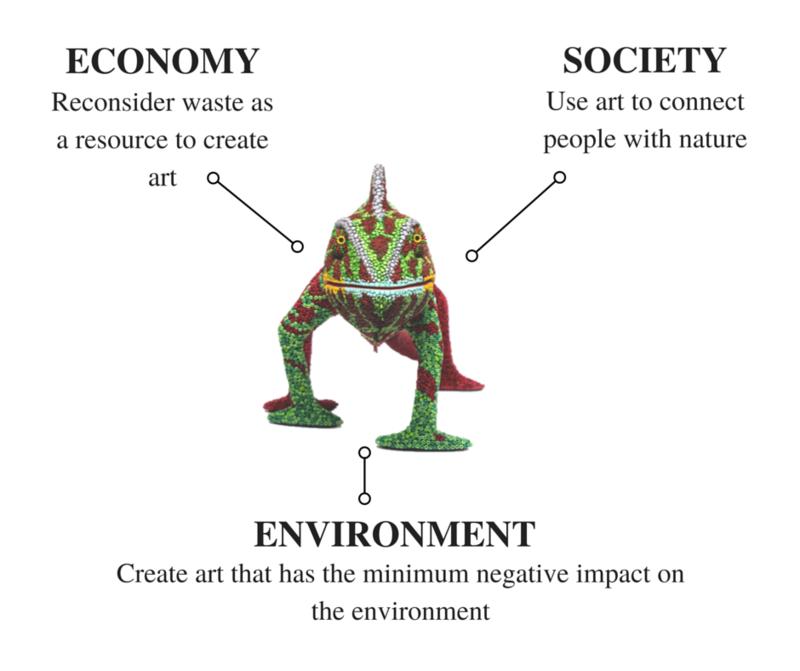 Environment: Art created in a sustainable manner has the minimum negative impact on the environment. I reuse and recycle. Newspaper, plastic bags, used clothing and other materials that would end up in the garbage is my main resource of raw materials. 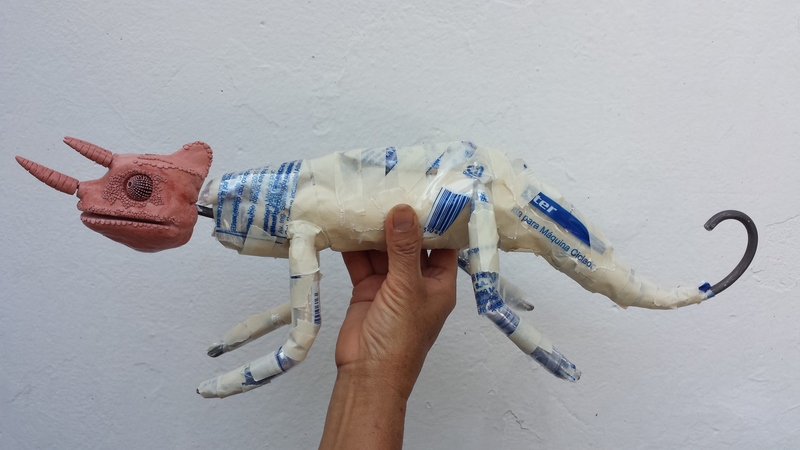 I especially like to sculpt my pieces with post-use plastic bags that otherwise end up, quite often, in the ocean swallowed by whales or sea turtles killing them. I reuse and recycle materials that otherwise might end up in landfills polluting. Instead of cutting down trees to obtain wood to carve my pieces, I use wood that was cut down naturally by a natural disaster such as a flood or a storm. Onnellisuus – Happiness. Acrylic on reclaimed wood (2016).